First of all of course water is liquid, it can move, flow, stream... It is not like a stone that is solid, motionless, and immovable. 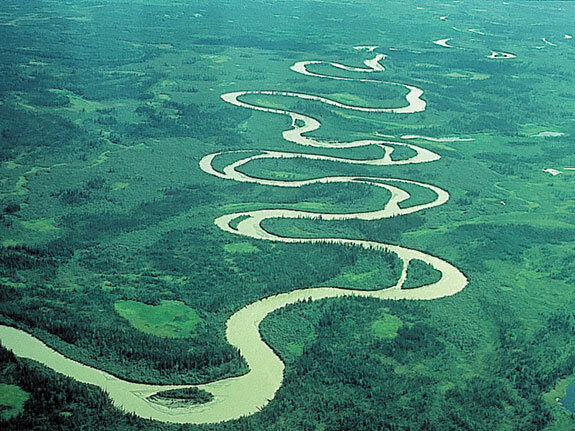 Water is heavy, it falls down to the earth, trillions of separate drops stream together in brooks, rivers flow into lakes and the water molecules join to become a mass, that adapts his form to the basin where it is hindered to flow lower, by solid material. 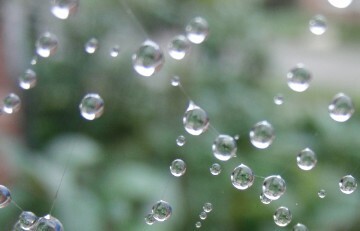 So ultimately all those many drops stick together into one bulk of water. The free surface of that water mass is flat, a horizontal plane. The slightest breath of wind will cause ripples, a fish produces waves, and a stone falling in it creates rings. Water is very sensitive: when you push it, it reacts immediately, by moving. Its mass is not breaking into pieces, water sticks together, moves as a whole. That whole will react on an impulse with waves, moving waves that will repeat rhythmical. When not influenced by any force, water tends to form round forms, spheres. Drops in a spaceship float around in perfect globes. Peculiar: when you should hit such a drop, it splashes into many pieces, which will form straightaway... balls, round drops. When they should meet, two drops flow together and form one new, bigger drop. The outside of this waterform is a kind of skin, membrane, like a balloon, that keeps together the mass of water molecules, pulls all in a ball form. Also the surface of pool, and of our watersoundimage, has such a surface-tention, that stics together en reacts as a whole. The float of a fisherman on a waving water surface tells us that each water part moves circular around. Floating in the sea will give you the same experience. Water in the sea, a pit, a pool, a tank or anywhere is always moving, even if we think it is standing still. Due to temperature-, pressure-, level-, acidity-, salt degree-, and many other kinds of differences, partial masses will replace themselves. This movement is not homogeneous, but in layers that pass each other in curved planes, like flying flags. 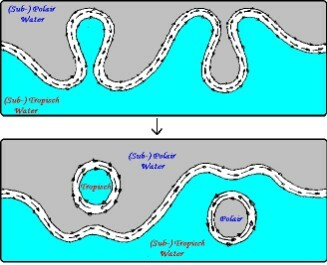 In a river the stream will organise a mainstream in the total mass of water, a so called "Thallweg", a combination of linear forward moving with a circular one transverse on it. The result is like a screw, a woven rope that spontaneously waves in the horizontal plane, so meandering. This meandering "Thallweg" causes erosion and depositing in the bed and banks of the river, and so the whole river will meander, in ever new round forms. This film about the Gulfstream shows how that big river also meanders en sends out circular eddies. Many other phenomena show the natural tendency of water to be round and spherical, to move circular and cyclic. In this context we can expect to see round forms and circular movements in our watersoundimages. Some aspects of the behaviour of water can be partial understand by means of the model of a water molecule. One water molecule is a magnet, with two north poles and two south poles. Imagine a pyramid with a triangular base: this is a tetrahedron (a regular polyhedron), with four corners or angular points. Two corners are positive charged, the other two negative. A negative pole of one molecule gets attracted to the positive corner of another water molecule. 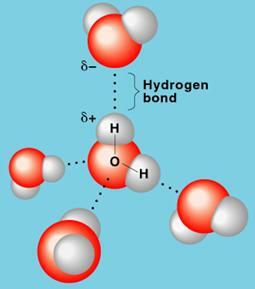 The H-side of one molecule is attracted to an O-charged side of another: this is called a Hydrogen-bond. Another corner of the first molecule attracts to the opposite pole of a next molecule. And so on: only when many of those water molecules attract each other in this way, we have water. Due to the geometric three-dimensional structure of this regular polygon, the structure of attracted "groups" is special. The result can be linear, cyclic, and even three-dimensional. A very particular phenomenon is the fact that in a closed, circular chain, the bonds get stronger then when not closed, they are cooperative. A regular polygon is stronger than another form; a regular polyhedron of attracted water molecules has more chance to exist longer. On the periodic impulse of the loudspeaker water reacts with movements, regular and round. Regular and rounded inner streaming give rise to a regular waving surface. This all is not a physical explanation of how those beautiful and regular forms and movements appear, only a few characteristics of how water behave.